I’m running my report on these two together, because they’re really quite closely linked. 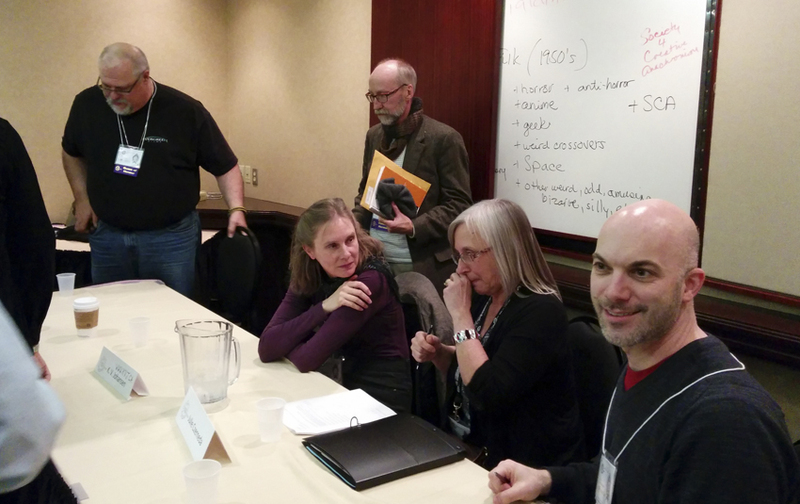 The first panel consisted of me, Steven Erikson, Derwin Mak, and Douglas Smith; the second me, Erikson, Derek Kunsken, Julie E. Czerneda, and David Weber. Blinded by the light. Non-European Fantasy Worlds. After some hassle, we got the lighting guy to turn off the eye-damaging spotlights. The research conversation carries on after the panel ends. In both, much of the discussion centred on doing good research. Histories, archaeology, personal travel, and scientific speculation were all discussed. Douglas Smith talked about dealing honestly and respectfully with another culture when writing primary world fantasy about traditions not your own. Erikson made the point that part of the purpose of fantasy was the broadening of horizons that exploring the unfamiliar and unknown brings, while I talked a bit about how the past is just as foreign as another place and that as authors, we need to do just as much research when incorporating elements of the past culture of our own ancestors as of someone else’s. In the world-building panel, Erikson had some rather blood-chilling war-stories of being an archaeologist in Central America in the eighties. Weber talked about the challenges of keeping track of his own technology. Czerneda told the story of building a model of her village of Marrowdell to ensure that the descriptions of light and shadows — essential to the plot and magic in A Turn of Light — would be accurate, while Kunsken described how he’d taken up the challenge of creating plausible life on a planet where a book told him it couldn’t exist. 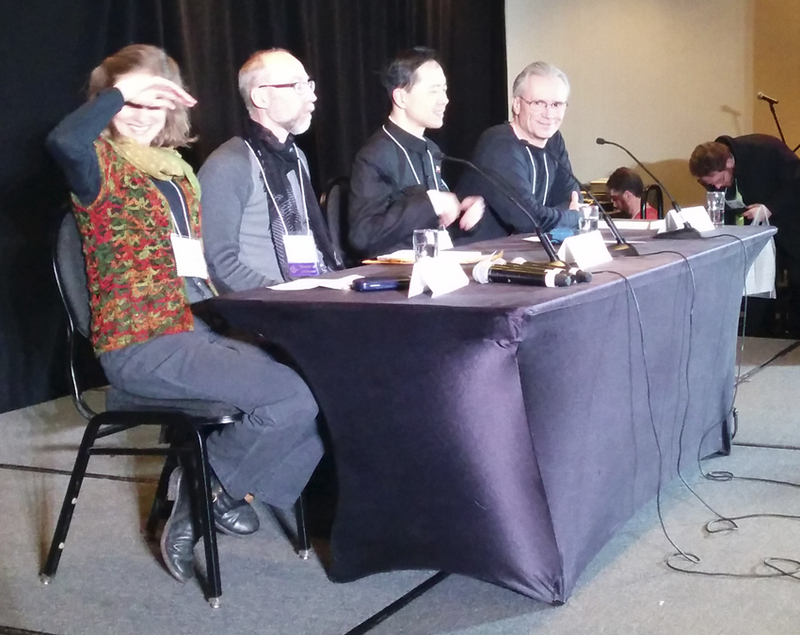 As a bonus, Derwin Mak’s moderating of the “Non-European Fantasy Worlds” panel, by breaking down the programme description into separate questions and working up and down the table to invite each author’s response, before taking questions from the audience, was very instructive. Next time I get volunteered for such a role, I’ll know better what I’m doing. And the fun stuff . . . not that the panels weren’t fun! My friend MC and I also attended some other events. Greenwood and Erikson discussing epic fantasy was particularly interesting, in a conversation that ranged over quite a long history, from Gilgamesh and the purpose of epic, to the current obsession with ‘grimdark’ and what that might say about contemporary society. We wandered through the dealers’ room several times, being particularly taken with the beautiful work of Irina at Black Currant Jewelry, and visited Bakka’s table. We took a short shift manning the SF Canada table while Ira had a snack break. Emboldened by one another, we also took an hour-long belly dance lesson. (We are not good at belly dance. We will not be giving up engineering or writing in the near future.) We attended Julie E. Czerneda’s reading from A Play of Shadow, sequel to her fantasy A Turn of Light. And finally, on Sunday, we met up with my friend and manga partner Connie Choi (yes, the manga version of “The Storyteller” is still alive, just in hibernation, since Connie’s a full-time student at present), and after some posing by a spiffy replica TARDIS and Dalek, abandoned the con for supper and some serious writing-and-art talk. My friend and expedition photographer MC looking ready to be whisked away for adventure. 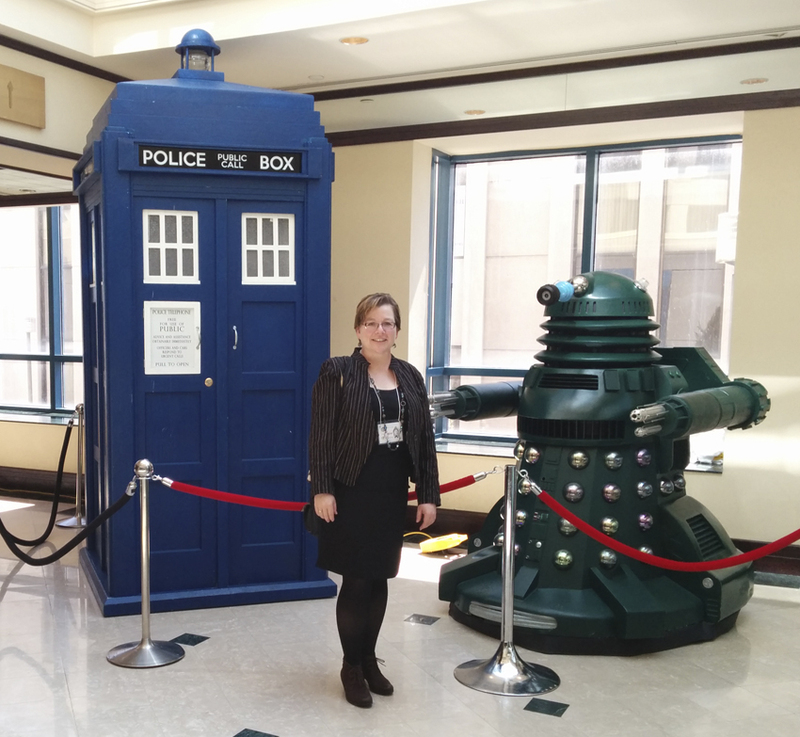 That Dalek is huge and scary. I don’t trust those museum exhibit velvet ropes to hold it back. Connie and I and a replica TARDIS. We think it was a replica. We couldn’t check, because the door was locked. This entry was posted in sf conventions, Writing and tagged archaeology, books, epic fantasy, fantasy novels, science, science fiction, world-building, writing, writing process. Bookmark the permalink. Okay. The Tardis and the Dalek and now I’m totally jealous. Too much fun. Hey, aren’t you in Toronto? You could have been there! I saw two other dogs attending. One was distinctly puglike.